I love chocolate. This recipe is RIDICULOUSLY easy, you will love spending the time to make it! From Gourmet Magazine & Cupcakes & Cashmere, please enjoy this awesome tart. Mine just came out of the oven so I will hold off glazing it until tomorrow. If you think you see little chocolate teddy grahams being smashed with a crystal glass, don’t worry my son didn’t watch! 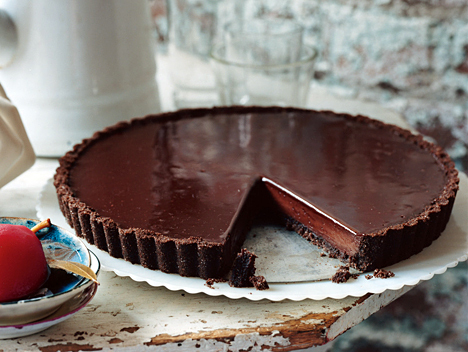 A triple layer of crumbly crust, a truffle-like interior, and an almost patent-leather-shiny glaze make this tart the chicest take on chocolate we’ve come across in a long time.